While the idea & concept of office lobby has remained unchanged for years, of-late it has started to take on more of a workspace connotation. Yes, for every organization the first impression matters and the reality is that whenever a visitor or guest enters an office premises, the first place he encounters is the reception desk and office lobby that briefly includes the guest seating area! 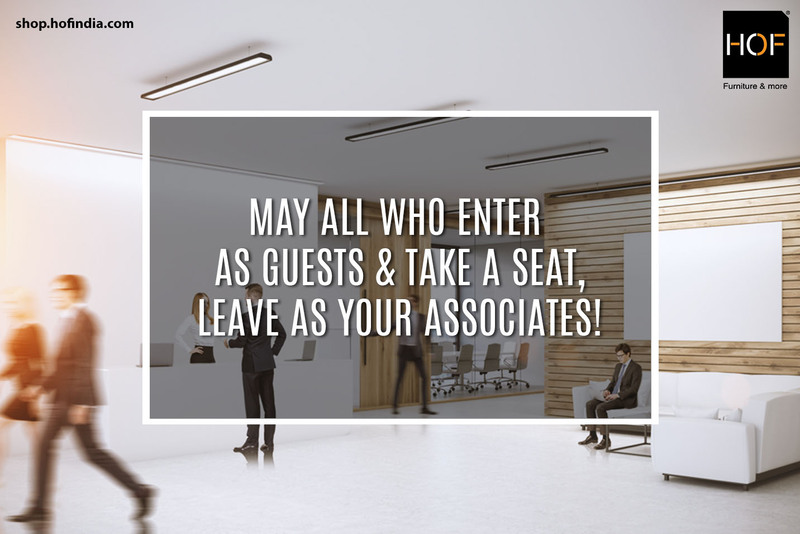 Besides nailing the first impression, the guest seating area also advocates your work culture. Hence it is mandatory to define & refine the guest seating area in your office with proper planning, keeping comfort and aesthetics in purview. To counter-balance the best match for visitor chairs at your office, primarily you need to identify the categories of visitors; approximate their purposes and duration of visit. Your guest list may include the VIP guests, high profile clients, stakeholders, business partners, sponsors, new customers and beyond these. And so shall the purposes of visit vary from visitor to visitor. Some may come for a casual meet & greet, while others may require attending conferences or board-meetings; some might come to pitch sales & give presentations while others may come for paper-work. Some may leave promptly while others might require tarrying for long hours! You will certainly want to make each one of them feel welcomed, comfortable and at ease. But to be victorious in this motive, you will need to realize that one particular kind of visitor chair cannot please or comfort every visitor. Therefore the guest seating area always requires a bit of customization and a be-spoke seating arrangement. Be a thoughtful host who never compromises with comfort and style– For longer project meetings, board rooms or meeting rooms and also for conference or seminar halls, opt for the most physically comfortable options that converges style, comfort and ergonomics. Select visitor chairs with high head and contoured back. Remember that the happy and comfortable guests are more likely to get associated with your enterprise. Colour your guest-lounge with luxurious shades of comfort – For the guest lounge and hallways use a cozy sofa placed along with a pair of guest chairs with occasional tables. The long L-shaped and U-shaped seating arrangements are also ideal for break-room and collaborative spaces where paper-works take place. Enliven the corporate vibes by adding a splash of colours– For the general seating area; you can experiment with colours and fabrics of visitor chairs depending on your budget and interiors. Addition of colourful chairs will jazz up the corporate vibes vibrantly besides adding a special edge to the dynamic environment. Drape a few sections in the sleek and trendy way – For short duration client meetings like in an executive office, job interview sections and impromptu conversations elegant visitor chairs can be used. They are light-weight with a fixed sledge base leg. With a sleek design of gentle curves, these arrays of guest chairs boast a sturdy metal frame with chrome accents giving you the perfect blend of style, comfort and durability. « Study chairs for students that they will adore, boast of & chair-ish!